Pope Benedict XVI will place a three-cornered red biretta on the heads of 21 new cardinals on Feb. 18, a traditional gesture in a ceremony that will differ slightly from previous ceremonies. In early January, the Vatican newspaper, L’Osservatore Romano, reported, “The rite used up to now has been revised and simplified with the approval of the Holy Father,” in part to avoid any impression that becoming a cardinal is a sacrament, like ordination. At this consistory for the “creation” of cardinals by the pope, red remains the color of the day to remind the new cardinals that they are called to give their lives to God and the church, even to the point of shedding their blood. Tradition and innovation, solemnity and festivity, high honor and a call to sacrifice are key parts of the ritual. The hushed moment when a churchman kneels before the pope and receives his red hat as a cardinal contrasts sharply with the mood later that same evening when the public is allowed to swarm up the Scala Regia—the royal stairway—and into the Apostolic Palace to meet the new cardinals. Immediately after the new cardinals are created, all the “princes of the church” are scheduled to vote on the canonization of several new saints, including Blessed Marianne Cope of Molokai and Blessed Kateri Tekakwitha. This will be the fourth time Pope Benedict has created new cardinals and will bring his total to 84 cardinals, of whom 79 are still alive; 63 of his appointees in the College of Cardinals will be under the age of 80 and eligible to vote in a conclave to elect a new pope. According to church law, new cardinals must have been ordained at least to the priesthood and should be ordained bishops before entering the College of Cardinals. In recent decades, however, many of the elderly priests named to the college as a sign of esteem and gratitude for their service to the church have requested and received an exemption from episcopal ordination. In keeping with the Jesuits’ promise not to strive for promotion in the church, Karl Josef Becker, S.J., an 83-year-old retired professor at the Pontifical Gregorian University in Rome, will become a cardinal without first becoming a bishop. Another small change made to the consistory this year involves timing. The prelates will receive their cardinals’ rings from Pope Benedict during the consistory, rather than at a Mass concelebrated with the pope on Feb. 19. And as is customary, during the consistory they also will receive their assignments to a “titular church” in Rome, which makes them formally members of the clergy of the Diocese of Rome, as were the church’s first cardinals. 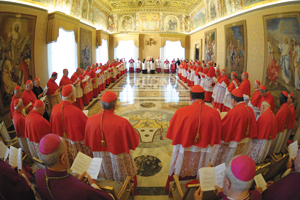 Once the new cardinals are created, the College of Cardinals will have a record-high number of members. The total number of princes of the church will reach 213, surpassing the total of 203 reached with the consistory in 2010. As recently as 2001, the total number of cardinals dipped to 139, just before Pope John Paul II named a record 44 cardinals at once. This article also appeared in print, under the headline "Creating Cardinals," in the February 20, 2012 issue.